A superb portable car mount for almost all smartphones, attaching to any vehicle air vent and holding your phone steady and in clear view. It also acts as a viewing stand. Compact and weighing next to nothing, you can take this with you anywhere. A great product, perfect when traveling, for use in rental cars. Easy to carry, fit and use in any car with a air vent with a horizontal or vertical grille. Holds my phone securely. Happy with my product as per the description. Had to wait for awhile before received it. It's small, as advertised. The arm springs are quite strong so holds the device quite firmly. I even got to leave my device in its case. It grips well on the vent. Not too expensive, so pretty good value. Exactly what I wanted. Grip is excellent which makes ime to be at ease when using the holder. Only wished it had the ability to adjust left and right not just rotate. Just what I wanted! Thanks! Exceptional after sales service and product quality. I researched all the products and this was the best iPhone grip for a car vent on the market. Really neat, tidy and secure. I found the customer service related to the sale outstanding and unexpectedly personable. Really happy! Totally recommend !! Even though my air vents are small, I am still able to use this holder to good use. Easy to fit and easy to insert 'phone. Holds it without any wobble horizontally or vertically. It's simple and well made but for the cost a little over priced. A great quality product with a minimalist look. Excellent - keeps the phone secure and steady. Got the BOGOF deal which was brilliant. Fits perfectly on the air grille. Really glad I got them. Works great. I love this thing. Fits iPhone XR with attached case. Fits well & securely on air vents in Discovery, Audi A5 and Micra. Great idea for a phone holder. Simple, inexpensive and it works. Works well. Fits any car. Will be useful for travelling. Having read the other reviews I was not disappointed with my new phone holder. Fits the vents on my Honda CRV perfectly. It does exactly what it says on the tin. Holds my phone securely (and I have one of the larger phones on the market) and is a quality well made product. I have ordered a number of accessories from Olixar via Mobile Fun and both companies never fail to please with their excellent products and service. Product arrived well packaged and in good condition. It is vary robust for a vent mobile ph holder and fits perfectly to any vent ( giving you great flexibility for best location. ) The holding clamps are strong and hold ph securely with no shaking or vibration. Another great feature is its ease of fitting so also portable . Just pull out of vent and take it with you to another location. Good 360 degree movement. A very neat , unobtrusive iPhone holder. I have this fitted to the centre vent on my VW Golf and it sits perfectly in my eyeline when using the Satnav app on my iPhone in portrait mode. I haven't tried it in landscape as it would obscure too much of both vents and possibly overheat the phone especially if it was plugged in. Fitting is very simple and if you line up the vertical and horizontal vanes in the vent when fitting you still retain some small amount of directional control of the air outlet (if required). The phone can be removed one handed from the holder (if you are reasonably dexterous) but I recommend using both hands when fitting to ensure a good tight fit. The phone is held snugly in the clamp and when pushed in fully does not move around even on rough terrain. This is a well made, simple little clamp and so far has performed as advertised. Doesn't suit the X Type Jaguar. The dashboard overhang means the holder can only be fitted horizontally. Good product very simple to use. Really good and simple to use . Why its in what Cars top 3. This is a great tool and just what I needed for the car without having to fork out lots of money. Thank you. Simple to fit and use and takes seconds to fit your phone into. Best little gadget..... fits perfectly..... phone secure and very neat yet strong. I have had other bulky holders but this is the best yet. This is my 2nd time of purchasing this smartphone holder from Olixar inVent. I have the Samsung Galaxy Note 3, which is a few years old now, and it fits and holds my phone either in portrait or landscape position very well. I prefer this type of car holder as it's minimum fuss and clutter in the car. Price is comparable too. I'm happy with this product hence why I brought it for the 2nd time. Small, simple and works really well. Holds my iPhone XS Max with no problem - horizontally or vertically. Wanted a phone support that was universal and certain to support my phone effectively. As they say in the ads it does what it says on the tin. But I still think it was a bit expensive. It holds the phone but you need to press the holder back onto the air vent every time. Great little gadget. Neat and adaptable. Very pleased with it. Really handy for keeping your phone at eye line height for looking at maps or for hands free usage. I already had one and bought it as a present for my brother. His phone is 8.3 mm wide and it fits well - would stretch a bit further for a wider phone also. Air vent holder is of excellent quality, holds my phone very well, both vertically and horizontally. Very pleased with product and service provided. Exactly what was needed. does the job perfectly. Thanks. Bought for a stocking filler. Hope this works. It was a reasonable price. I will recommend this product but don’t know how it will perform. Bought as a stocking filler for my son who does a lot of driving using his phone as a sat nav. Can’t comment on use as he hasn’t received it yet but looks like it will do the job nicely. Bought on reviews of this product so confident he’ll be pleased. Thought I would take a risk and try it for my Audi but as the vents are round it does not work unless you jam it in and then the plastic cover came off the clip which holds the whole thing on. This little baby does precisely what I wanted. So, ticks the box for me. Good purchase works fine and fast delivery. You can't fault the production of Olixar products. Very well constructed, slips onto the vent with the ability to move it, which is important to me, as I didn't want anything clipped onto the vent permanently. Holds very well even on UK's bumpy roads. Slips on without damaging vent. Happy with purchase. Fits perfectly in the vent and grips my Moto G and its cover perfectly. Well worth the money in my opinion. Just the job. Grips the vents securely, opens to hold phone even with a case on, and as the holder rotates it can be used portrait or landscape. And once the phone is removed, the holder can be left in place as it's so inconspicuous. Nothing ,I saw the device in my daughter's car and was very impressed. Fit's perfect in my car (BMW 1 series). Will fit any mobile device. Small, lightweight, grips the car vent and holds my phone in place - extends to hold most sizes of phone. I have a small iPhone that it holds firmly but will extend for larger phones. Small and neat, just as the description and good value. I needed a product to secure my Iphone in the car so that I could use the traffic App. The product is fantastic. Works perfectly. Much better than any other I’ve tried. Great service too! I had high hopes for this product but it really is great and I am really pleased with it. No hassle to attach to air vent and really simple to use. Tried in three different cars and works very well. Am going to buy two more for my son and daughter. This is a clever little gadget that works well. Although my car doesn't have the horizontal vents that some cars have, I was prepared to gamble that this little gadget could work for me. Result ! I was able to attach it to the vent with its great little clip. Very pleased. 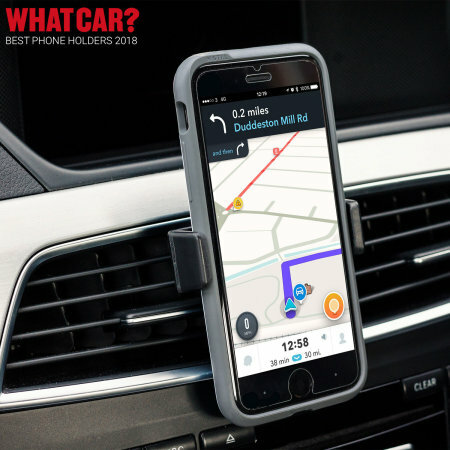 Perfect little product - stable, holds my iPhone 6 nicely, tried it in 3 different cars so far, and have now bought a second one for my wife's car. Good value as well. Good stuff, small portable expands to fit phone.. does what it says on the tin. Simple but effective. East to use and arrived promptly. Maybe the phone is too big, not sure, but it doesn’t work for me sadly. Seems like a good product though. Smart and practical! Holds my phone without any trouble! Well made and functional phone holder. I use it to hold a review trailer camera. Arrived within 3 days of ordering. A simple yet sturdy phone holder for my car and which clips to the heater vents. Adjustable for portrait or landscape orientation of my One Plus 6 Phone. Really pleased with this - so small & simple. Really easy to pop phone in & easy to attach. Fast delivery.